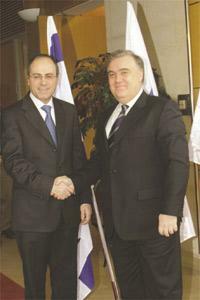 Silvan Shalom and Michael Frendo. Foreign Minister Michael Frendo yesterday had talks with Israeli Foreign Minister Silvan Shalom on the Middle East peace process and relations between the two countries. Dr Frendo affirmed his wish to develop relations with Israel and to further political exchange of views particularly in the context of Malta's membership of the EU and its participation in the formulation of the EU's Common Foreign and Security Policy, the Foreign Ministry said. On the Middle East peace process, talks focused on the renewed optimism and on the need to sustain the present efforts. In this light, Dr Frendo augured that both sides would acknowledge reciprocal difficulties and pursue action that would strengthen the credibility on the ground of all those involved in the peace process. The minister was on a Middle East tour which included meetings on Saturday in Ramallah with Palestinian President Mahmoud Abbas and with a number of Palestinian ministers and the mayor of Bethlehem. Dr Frendo is expected to visit Israel in April.